Is there a way to include a member’s first name, surname or username in an email? Don’t like the text in our emails? Well now you can change them! (as long as you’re tracking our tests-passed branch) Just visit Admin > Customize > Email Templates and you’ll be presented with this nifty interface: [image] Give it a whirl and let us know how it works out for you. Is there any any way to get this done? 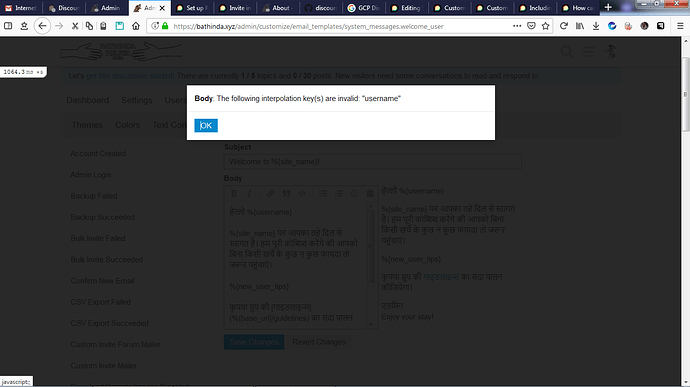 Body: The following interpolation keys are invalid: “username”. What does this error mean and how to overcome it?